We think the details are just as important as the big picture. 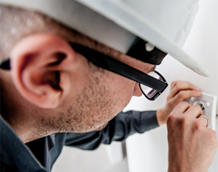 Whether it’s repairing a light switch, or a full residential rewire, we make sure that your domestic electrical work gets our full attention from start to finish. Melbourne homeowners value the peace of mind that comes from hiring Electricians Today, and it’s easy to see why. We also understand that your electrical needs are unique. We work with you from start to finish, making sure you’re aware of all the options, so you can make the most cost-effective and informed decision. We never compromise on the finish of our electrical work or the quality of our materials, and our handpicked accredited team members will always turn up on time, every time. You can enjoy the peace of mind that comes from a safe, trustworthy and professional electrical service.